Yardstick coffee table. – Anchored Way Trading Company. I have had an old wood coffee table sitting in my workshop for over 2 years. I unfortunately don’t have a before photo of it, but you can use your wonderful imagination. I got it with the intention of giving it just a simple paint makeover. I pulled this piece back out the other day, grabbed a stack of random stir sticks and yard sticks and got to work. The first thing I did was cut down all of the yard sticks and paint stir sticks to size, attached them with both wood glue and my handy new Dewalt 18 gauge brad-nailer. This tool has been such a big help with all of my projects. I am excited to use it more this spring and summer to tackle more wood working projects and to actually BUILD more! After cutting each yard stick/ paint stick, I glued them all down in no particular order. I did this one piece at a time, before planning out where they went, so it is completely random as you can see. No rhyme or reason worked for this one. Then once each piece was glued down, I put in a few short nails with my brad nailer into each piece. Next, I taped off the edges of the stir and yard sticks, and painted the rest of the table in ‘Old Soul’ grey paint, which I got as a sample from the Eau Claire Fleet Farm. 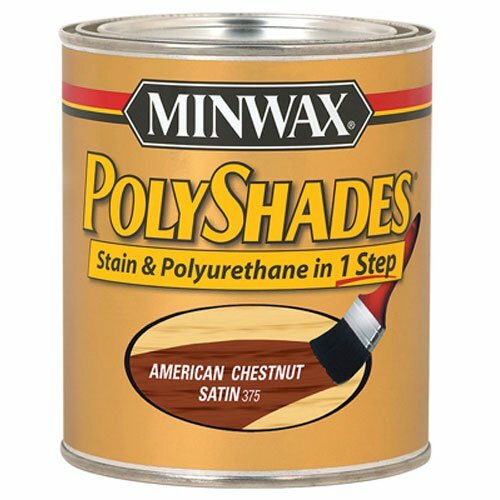 Once the two coats of paint dried, I took off the painters tape and gave the entire table, including the yard/stir sticks a nice coat of Minwax Stain + Polyurethane, Polyshades Satin in the color ‘American Chestnut.’ This is one of my very favorite stains to use! After staining, the table was finished! Take a look below at the final result! This coffee table will be for sale soon in my booth at The Shed in Altoona, WI (1519 Mayer Rd). Or you can message me if interested in purchasing first!